Food sovereignty is a difficult concept. There are several definitions of it and these can be explained in many ways. This brochure takes the definition of Nyéléni 2007, an international forum that took place in 2007 in Mali. Farmers, consumers and activists from many different countries discussed the importance of food sovereignty and how the activities related to food sovereignty could be coordinated better. In 2011 a European version of Nyéléni took place and a new declaration about food sovereignty was drawn up. When the European declaration was drawn up the definition that was formulated in Mali was taken as a starting point. Therefore it was decided to take this definition -which is reproduced below- as a starting point as well. It is actually more a description than a strict definition, but it does show well what the concept entails. ‘Food sovereignty is the right of peoples to healthy and culturally appropriate food produced through ecologically sound and sustainable methods, and their right to define their own food and agriculture systems. It puts the aspirations and needs of those who produce, distribute and consume food at the heart of food systems and policies rather than the demands of markets and corporations. It defends the interests and inclusion of the next generation. Food sovereignty prioritises local and national economies and markets and empowers peasant and family farmer-driven agriculture, artisanal fishing, pastoralist-led grazing, and food production, distribution and consumption based on environmental, social and economic sustainability. Food sovereignty promotes transparent trade that guarantees just incomes to all peoples and the rights of consumers to control their food and nutrition. It ensures that the rights to use and manage our lands, territories, waters, seeds, livestock and biodiversity are in the hands of those of us who produce food. Food sovereignty implies new social relations free of oppression and inequality between men and women, peoples, racial groups, social classes and generations. 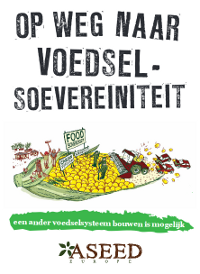 The brochure by ASEED provides information about what food sovereignty is and what it is fighting (namely the current dominant food and agriculture system). A few practical alternatives in the Netherlands are also addressed. Less focus however is on the discussion about the concept of food sovereignty itself and the explanation of it. Therefore in this article a few possible questions/discussion points that flow from the literally words as well as the different interpretations of the definitions are reviewed 1). In the dictionary sovereignty stands for ‘supreme rule, authority that can be limited by no other’, or the right to self-determination. For example, this refers to the right of a government or a community to define binding rules about the production, trade and consumption of food within its own territory. There are different levels one can think of. In the South the level of the nation-state is often taken is as a point of reference. States should for example be able to determine whether they want to accept food dumping from the North. In Europe often the EU is referred to as an area in which the Common Agriculture Policy (CAP) determines the food and agriculture production. Several groups lobby and do actions to get a change of the CAP so that food sovereignty will be part of it 2). ASEED is more inclined towards the regional level (an area with a radius of about 50 kilometers). Food sovereignty mainly implies that farmers and consumers retake control over the production, processing and distribution of food and that they strive to shorten the food chain as much as possible. Sovereignty is the right to self-determination or supreme rule. Autonomy means self-government or independence, the right to determine what you are doing yourself. From a political point of view, sovereignty is based on the right to determine binding rules within a certain territory without any restrictions of outside forces. Usually this does refer to nation-states that are sovereign within their own borders (this sovereignty is however often not absolute (anymore)). Autonomy takes the individual or a group that takes autonomous decisions as a starting point. In a (democratic) state such a person or group often is limited in their autonomy by laws that are made by governments. Because sovereignty is often associated with the freedom of nation-states to make laws within their territories without restrictions by others and because autonomy is more associated with the right of individuals or groups to make decisions, food autonomy seems the more appropriate term to use, especially in the Netherlands. However at the international level, the term food sovereignty is being used more and more. Who’s rights and how to implement them? How do you make sure that the conflicts between different food producers are solved? Who’s right is important? An important starting point is that the food sovereignty of the one should not damage that of another, but how can you accomplish this? For farmers questions that matter are: How can one solve conflicts about land? And how much water can each farmer use and how do you arrange access to water sources? And, can you choose to grow cashcrops for export when your neighbours are hungry? And for consumers there are questions like: What does the right to cultural appropriate food mean? How far does the right to choose go? Does one have the right to a piece of meat everyday because you are used to it? Does one have the right to cheaper and/or more beautiful potatoes from abroad while neighbouring farmers have overabundance? And, do people have the right to products from far away, like coffee and bananas, and if so, how does one arrange the trade of these products? ASEED values the ecological and social arguments more important than free choice. If agricultural land is needed for local food production than this should be used for it and not for the production of coffee or feed. Not damaging the well-being of one has priority over the luxury of another. Free to protect and to support? The power inequalities between poor and rich countries are large. Rich countries in the North protect their food production with subsidies and restrict the import of agrarian produce from the South with tariff walls and several (costly) conditions. Can rich countries keep on protecting their own food production in this way? Also relevant here is the principle that the food sovereignty of the one should not damage that of another. From the last sentence of the Nyéléni definition follows that everyone has an equal right to food. Countries and companies should therefore refrain from buying or leasing fertile land elsewhere to solve their own food shortages (land grabbing) and from dumping cheap, subsidised food. Solidarity as part of food sovereignty precedes here. The city provides far less opportunities to grow food than rural areas do. On farm land lots of fertile land can be available so one can live in abundance; others in a nearby city (or on the other side of the world) could go hungry because they cannot grow sufficient food. Also in a case like this solidarity should be leading because producing food for others who need it should have priority over abundance. This should not lead to power abuse (think of dominance, colonial behaviour and land grabbing). How does one determine the price of food? What is a reasonable income for a farmer? Does he or she has the right to a similar way of life and level of wealth as the neighbours? What to do about the external costs of food production, for example in the form of damage to the environment? Does one have to incorporate those into the price? But how do you prevent the situation in which rich people can still afford to use too much and the poor cannot?No food sovereignty without a more equal distribution of wealth and equality between populations and the sexes. How do you assess what sustainable production is? The brochure already mentions this, see the part about ‘agro-ecology’. Can a local group of farmers who decide to start or keep producing in a non-sustainable way, still call on their right to food sovereignty? For ASEED producing in an ecological sustainable way is more important than the right to choose for a polluting and soil degrading agriculture. Saving and restoring land, seeds, water and other scarce resources is part of food sovereignty, so that also the next generation of farmers can still produce food. This principle may sound logical and obvious, but in practice the implementation may be difficult. It is not always clear what is ecologically sound and what is not. The same goes for the points mentioned earlier. For example, what is an equal distribution of wealth? What does a local and democratically organised food production look like? There can be lots of discussion about this. All the same it is clear that the current food and agriculture system is still far from being social, sustainable and solidary. A battle for food sovereignty is therefore very significant. The term food sovereignty (or food autonomy) is a notion that can be explained in many ways. Different groups can find themselves attached to it because of the room of interpretation. The food sovereignty movement strives to find an alternative to and fights against the current dominant food system. The movement seeks mutual solutions for the current problems with resources, the environment and social and economic problems. 1. Several discussion points are already mentioned in other articles (which still need translation into English). See for example: “Food, What’s is it’s value?”, “Food Sovereignty, food in your own hands” and references in “What does food sovereignty look like?”. On the website of Nyéléni 2007 a few interesting dilemmas are also mentioned. See: “Developing and strengthening the concept of peoples’ food sovereignty”. When preparing this article several people of ASEED did critically go through the text of the declaration. 2. See for example the “Declaration of Utrecht” by the platform Andere Landbouw (PAL) that refers to changing the CAP.